Learn how to handle inquiries, promote positive "chemistry" between your self-storage company and customers, handle customer objections and complaints, avoid common service mistakes and more. The world is changing and so is the way we interact with our self-storage customers. Although technology opens new avenues of communication and revenue, there's no way to truly replace the one-on-one interaction and experiences created by good customer service. Service is an experience, and the memory of each transaction—good or bad—stays with us. 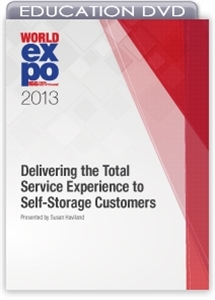 In this session, you'll learn how to create the total service experience customers crave. Our presenter will talk about how to handle inquiries, how to promote positive "chemistry" between your company and customers, how to handle customer objections and complaints, common service mistakes and more.